To the Editor: In early September we1 alerted users to the fact that the overall downward trend in the national HIV antenatal survey results released by the Department of Health in the last 2 years2,3 was an artefact of changes in the methods being used by the Department. Using the information provided at the district level in the latest report for 2007, we have calculated the provincial prevalence applying the method used in the 2006 report. This involves simply summing the number of HIV-positive cases per district sample and dividing by the total sampled population for the province. The national prevalence is estimated as the weighted average of the provincial prevalence rates, using the number of women in the 15 - 49 years age band in total in each province as weights. When this method is applied to the 2007 district data it does not reproduce the published provincial estimates for 2007! Table I shows what the estimates for the provinces and the country would have been had the 2006 method been applied to the 2007 data. From this we see that the prevalence has not fallen over the past year and may well even have increased in places. However, it is difficult to draw conclusions by simply monitoring overall prevalence. Prevalence falls when the number of deaths of those infected exceeds the number of new infections over a given period. If this is because of rising mortality as the epidemic follows its natural course and matures, as would be expected in the absence of large-scale provision of antiretroviral therapy (ART) in epidemics that experienced the rapid rise in prevalence seen in South Africa, then a falling prevalence is not particularly good news. If, on the other hand, it happens because of falling incidence as a result of interventions or changing behaviour, then of course it is good news. However, the picture is complicated by the extensive provision of ART, which has the immediate effect of lowering the mortality of those infected and thus causing, if the incidence remains unchanged, the prevalence to rise. A rise in prevalence in such a situation is also evidence of success. Both appear to be happening in South Africa, possibly complicated by the fact that the incidence may only be falling in some age groups and not others. As is shown in Fig. 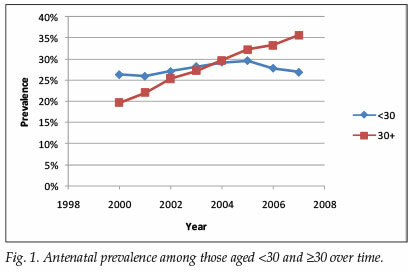 1, despite not knowing to what extent the change in sampling protocol in 2006 may be responsible for the drop in prevalence at the younger ages, it would appear that the prevalence among those below age 30 has peaked, while the prevalence among those over 30, which would include the majority of those receiving ART, continues to rise. Undoubtedly ART is contributing to the rising prevalence at the older ages, but to what extent the rise is due to this alone and to what extent it is due to high incidence cannot be decided without using modelling to see what would be expected, and for this researchers need access to the detailed survey data, as well as data on the extent of the ARV rollout. The Department's response to having the error pointed out has been to 'stand by the 2007 results', assert as a 'fundamental fact' that the methodology had not changed, and 'treat with contempt' any suggestion that they had manipulated the methodology.4 They also undertook 'to urgently convene a meeting of experts ... to deal with the controversy around the 2007 results'. It is now nearly 2 months since their report was released, and there is as yet no sign of such a meeting being convened, or any other response from the Department of Health. One of the consequences of the delay is that the results are open to misinterpretation (see for example a recent article in the Mail and Guardian5 attempting to explain why HIV has fallen in South Africa, on the assumption that the Department's report is correct). We can only hope that those charged with oversight of the national process, such as the South African National Aids Council (SANAC), see this as an important enough issue to ensure that the data are made available to the wider scientific community to process and interpret them thoroughly in the interests of achieving a better understanding of the epidemic.